I want to contribute by posting about the coop that we have just finished. In all my lurking on BYP I didn't find anything exactly like this posted previously- so hopefully it might give someone else some extra ideas to use at some point. 2) Simple to make- we are not particularly handy, have few tools and no shed/workshop space. I wanted to be able to do about 80% or more of it without help (for context I'm a mum with young kids). 3) Semi-permanent- we will renovate our house/yard in a year or two, so didn’t want to be cementing in poles etc. It had to be easy to move/remove as our plans for the yard change. A movable tractor wouldn’t work on our sloping uneven block. 4) A decent sized area that is as fox-resistant as possible- we have heard that foxes can even take chooks in the day around here- so free ranging isn’t an option. The design I eventually found and settled on was similar to a “hoop-coop” but not mobile. I think people often make greenhouses a bit like this. I found the idea it on a wonderful blog- https://foodnstuff.wordpress.com/2014/09/10/new-chook-run-coop/ along with detailed instructions. I am not for a second claiming the design as my own -Bev gets full credit. The frame is made of star pickets and 'blue line' ag-pipe with mesh connected to the pipe using cable ties, then more firmly secured with metal c-clips. All very doable- we found having a second person meant we could get the mesh on without the use of wooden support bars that Bev used in her version. There is a mesh skirt buried around the perimeter- about 60cm or more all around. The door frame is an old window screen found at the tip. The sleepers were left lying around our yard by the previous owners, but were handy given the sloping site. I also made an elevated house that sits inside the enclosure with roost and nesting box from salvaged pallets and other bits and pieces found at the tip shop. Three lovely Orpington girls moved in last week- we adore them . We are all learning things about each other along the way, but so far they seem happy with their new home (we have added shade cloth and a mister given the horrible heat this month!). I’ll add some pictures of our coop, and hope this post might be of use to someone else planning a coop one day. File comment: House - legs/base found at the tip shop ($10- yes please!) the rest is cobbled together from pallet wood, some plywood and colourbond panels also from the tip. File comment: Ginger and Freckle. I love your run and house - I do a lot of recycling and looov the tip shop. One of my criteria is that just because things have been re purposed they shouldn't look like cobbled together 'junk' - things need to be done neatly but the novelty needs to 'shine thru'. You've done just that. The hoop run is great and looks really secure. You can enjoy your chooks with out worrying about their safety or comfort. That's good work GinaGee. We plan on similar for the night-safety pens for geese. 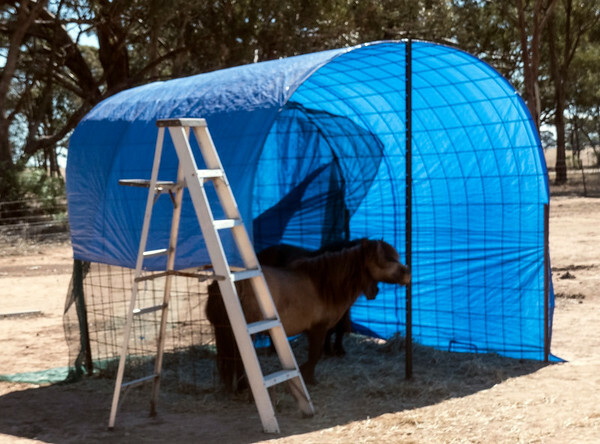 This "prototype" is to give a pair of ponies some shade and to keep their hay dry if it rains (we wish!). From all new materials this has cost $43, it includes just a length of flexible concreters' reinforceing mesh from a steel yard, tarp from Bunnings, steel droppers to fix to, with an extra long one each end for stability. For chooks and geese it will need 'fox-retardant' wire netting clipped to it, and proofing at ground level, wire skirt with timber, or cement pavers - plus a clever walk-in door like yours. So total cost expect well under $100. And very extendable - the one I plan for the Silkies is triple-length covering dwarf apple trees for shade. Edit as forgot to mention time taken. From pulling the length of reo off the delivery truck, one man, just under two hours to finish, included driving in star pickets and a coffee break (and pushing daddy's little helpers ponies out of the way). Wow - looks great! Well done! Not hijacking your thread GinaGee, but you mentioned tip-shop buys. 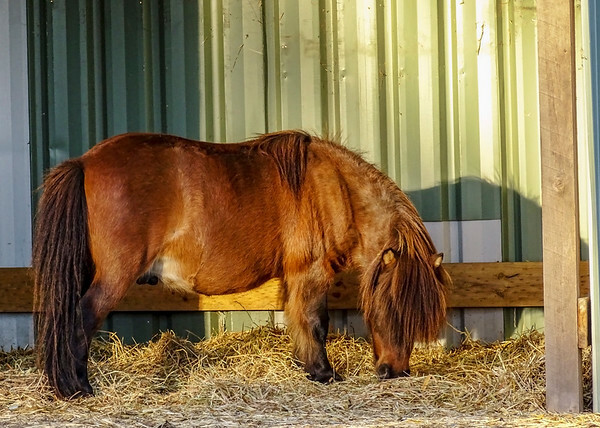 Not wrong - I only had one little field to suit Ben, our blind pony - and it had no shade to speak of, and very open to cold west wind. For $70 at the recycle centre I found a large stack of colourbond sheets, enough to build him an east-facing roofed field shelter, with higher walls behind it to cut the wind on both sides. This has only used half the sheets, still enough left to build two more field shelters at least. (Or to do something maybe a bit less pony and a bit more poultry). Thanks so much everyone for you comments- you are all very kind! The girls certainly seem happy and we just love having them around. Sue55- I found some of your threads when researching and they were very inspiring. You made me wish I had someone around who could weld! I'm with you on the tip shop… there is something that just makes me so happy on the inside having used discarded bits and pieces to make something else with a whole new purpose. Rach your info was also super helpful- especially the recent pics you posted about fixing mesh to wood… the washer technique came in handy. Good luck with your night-safety pens PossumCorner, it looks like a great prototype. The extendable aspect is a definite advantage of this kind of design. Ooo and I love the patchwork colourbond shelter and fence that you just posted. There is almost always some colourbond at our local tip shop… I guess it is all from old fences that people decide to replace. (Again… if only I had metal cutting and welding skills!) That pony looks super happy and warm. Now I just need to help my girls work out what roosts are for and gently discourage them from using the nesting box as a bedroom. Shame they look so cute with all three of them bundled in there together when I go out to tuck them in. GinaGee thanks for sharing! This is almost exactly what I want to build too. Can I ask how big the 'floorplan' is? It looks like about 3 x 5 metres but I would have thought you'd need more than 55m2 wire for something that size. The only thing I plan to do differently is find a way to keep any timber from touching the ground, because I live in an area with lots of termites. Happy to report a few months down the track our set up is all still working well. The girls are happy and definitely part of the family now. I’m letting them out into the garden while we are home too which they love. Eggs at some point would be wonderful! Apologies Joyburton- I’ve not looked at my post for ages and have just found your comment. You are right it is about 4.5 x 2.8 m. I spaced the star pockets slightly less than the 90cm width of mesh. I bought the mesh in 3 lots (30m at first then 15m then 10) so it really was 55m of 90cm mesh. Hope you you’ve made progress with yours. I saw Gardening Australia this week had a similar design run but up against a colourbond fence- it looked great. Thankyou so much. Possibly the most helpful post ive seen.